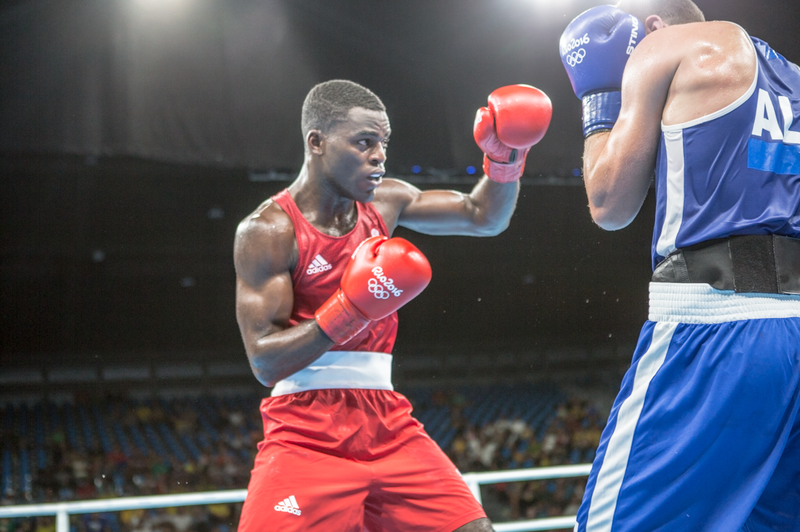 Joshua Buatsi has secured Team GB’s first boxing medal of the Rio 2016 Olympic Games with a unanimous victory over Abdelhafid Benchabla of Algeria in the light heavyweight quarter final. Buatsi opened the first round scoring immediately with on target shots. Up against a three time Olympian and the number four ranked boxer. He gave a dominant display of boxing causing his opponent to have a standing count in the first and second round. An inspiring contest from Buatsi who landed shot after shot on his opponent. Benchabla showed pride coming back from two standing counts but it wasn’t enough as Buatsi had clearly dominated the contest. Speaking after his bout, Buatsi said: “I have to give credit to the coaches. We’re in the month of August and this marks exactly two years that I’ve been on the Great Britain team and two years since I’ve been on the international scene. “I’ve improved for every fight and I’ve been on a long winning streak. I’ve just got to keep it going now. Buatsi who is guaranteed at least a bronze medal at the 2016 Olympic Games will now face Kazakhstan’s Adibek Niyazymbetov in the light heavyweight semi-final on Tuesday 16 August at 2230 GMT. Earlier in tonight’s evening session light welterweight Pat McCormack narrowly missed out on a place in the quarter final when he lost by split decision to Cuba’s Yasnier Toledo. McCormack was up against the reigning 2012 Olympic bronze medallist, who was the tournaments number two seed. Round one was a very close opening round between two very skillful boxers. McCormack held his ground well, keeping the Cuban at bay. Into the second round and it was more skillful boxing from both opponents, each waiting for the other to make a mistake. The third round showed immense talent from McCormack who had shown that the days were long gone when Cuban boxers used to outbox British boxers. It’s not been an easy ride for the 21-year-old from Durham who had to beat Kazakhstan’s Zhussupov in the opening preliminary round. He then went onto face the tournaments favourite for gold in the second set of preliminaries. It was a great display of boxing from McCormack who was eliminated from the contest in a very close bout, by split decision. Pat told Team GB: “I’m absolutely gutted. I got a terrible draw with the Kazakh first and then the Cuban. I beat the Kazakh and it was a very close fight with the Cuban but I never got the decision so it is what it is. “I know I can mix it with the best now. I only got beat on a split decision against a guy who I think is the best in the world.